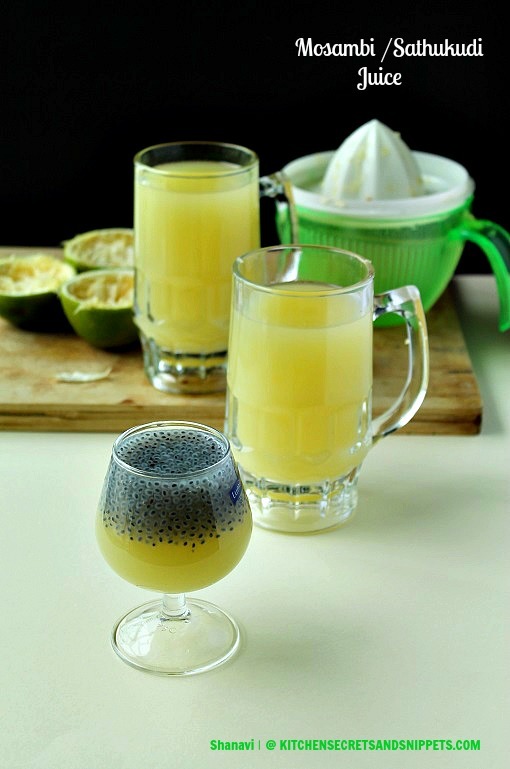 Mosambi juice makes the system to stay hydrated and it's cool for this hot weather. Also the basil seeds does the same, so what if we combine the both and makes one osm drink for this summer. 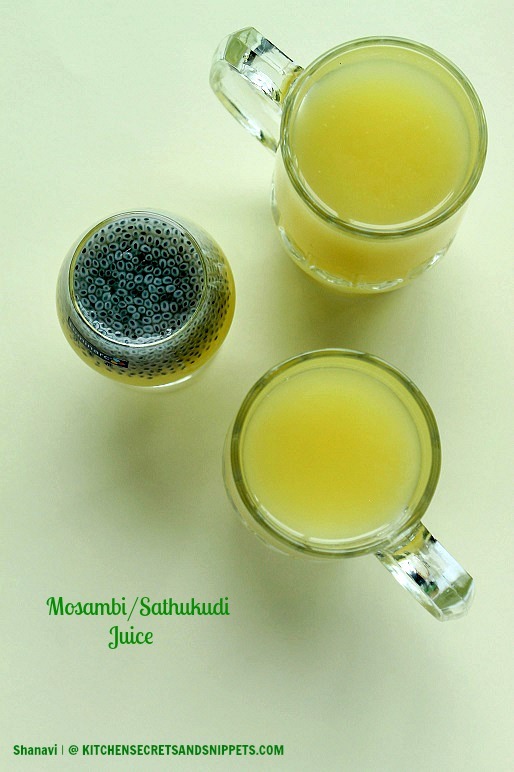 Yes, that is what I'm going to post today and am sure u guys would already be making litres n litres of juice everyday,still just an idea for this sultry summer..
Sathukudi / Mosambi fruit - 2 nos. Soak the Tukmaria seeds/Basil seeds in water for half an hour. Cut the mosambi fruit into half and squeeze out the juice using the juice extractor. Else peel the skin of the mosambi fruit and take out the slice one by one. Remove the seeds if there are any, dump them in the mixer/ juice maker and give a whip for 2 to 3 minutes, or until the juice is extracted. Filter the juice and put the pulp back again in the mixer and add very little water again give a whip for 2 times and filter the juice. Throw away the remaining. Now add the lemon juice, sugar/honey to the mosambi juice and mix well. 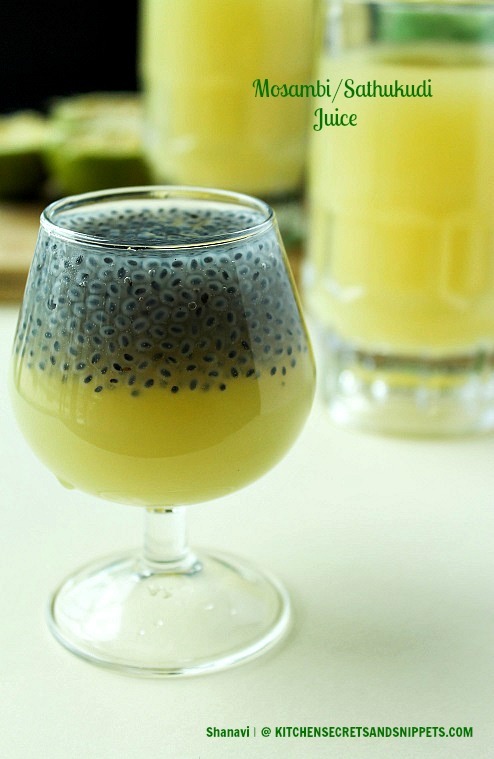 Pour the juice in a serving glass and top it with the soaked basil seeds. Serve chilled. Make sure to remove the white skin underneath the green skin(outer cover) of the mosambi juice, else it would taste bitter. Do not forget to remove the seeds as well. I prefer to add sugar, adding honey is individual's choice. very clear and beautiful presentation dear.. love this juice anytime.. Refreshing and cool drink !! Mosambi juice looks delicious I miss them here.